For Justice, Peace, & the Earth! Below is a letter from Hawaiian grassroots leader Palikapu Dedman in defense of his traditional religious practice. Pali placed iwi (Hawaiian remains) in the ahu (altar) built on the proposed TMT site on Mauna Kea. The letter addresses Richard Ha who is a TMT supporter. 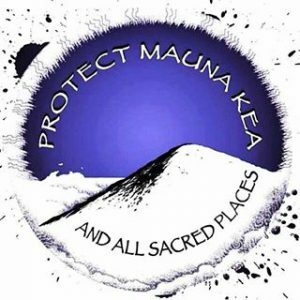 Never realized a journey with my ancestor like many before me to Mauna Kea in 2015 was going to create such a problem to other Hawaiians. It saddens me that historically we never learned that Western contact ever cared about who we are as a people. In our time of occupation and colonization we now see results of such generational conditioned Hawaiians. I have never dug up anyone and never will. I just practiced my rights from birth. Being ignorant about Hawaiian traditions is not an excuse, go and learn about it? You do not dictate another Hawaiian family’s practice. My soul purpose on this earth as a Hawaiian is to act and be one. It is not to please you “Ha” on your foreign thinking. I am what I am, “Hawaiian” by definition. I can see the creation of genocide and how they use these Hawaiians as tools to act and speak for them. When a Hawaiian sounds racists to his own kind, is that right? “No.” You are just a racist in a brown outfit. To react in public for help and to support your insecurities is obvious. You “Ha” and other Hawaiians who never got over your Geo push, that never happened and new problems with UHH & TMT. You can’t dress up “pilau.” I do have the law, to protect all of my actions. ARFA, NAGPRA, 1st Amendment, Article XII Section 7. As an E5 three year Vet, I defended all rights mentioned. The burial council on every island has an agenda full of “iwi” that they will reenter some place. I really hope all you concerned Hawaiians show up? Be consistent with your interests. Richard Ha, not all of us are for sale and accept force assimilation jammed down our throats. I have never spoken for you. You are not worth it and never will be. I am speaking of me as a Hawaiian acting and feeling comfortable in my skin. Our problem is not to become westernized, that’s easy. It’s staying Hawaiian to its core, that’s hard. So to all you Neo coconuts, a part of “Ha’s” voyage, go eat and smoke his la’au. You might be enlightened. Ha! Ha! Ha! Ha!! FYI Please pass the word. Come and support Micronesians. Mahalo. Wednesday, March 1, 2017, 6:00 – 8:00 p.m.
On March 1, 1954 the U.S. government tested Bravo, the hydrogen bomb on Bikini atoll in the Marshall Islands. The test proved to be 1,000 times stronger than the Hiroshima A-bomb. The Bravo test was just one of 67 nuclear and atomic tests done at Bikini and Enewetak from 1946 to 1958. The Bravo test Remembrance Worship Event, the 63rd anniversary of the Bravo test, is the third to be held in Hilo. The agenda will include: 1) Service of Remembrance, 2) “Nuclear Savage” DVD, 3) Testimonies representing Bikini and Rongelap atolls, and 4) a medical report of the present situation of Micronesians in Hawaii. Planners of the event are Rev. Maize Luke of the Hilo Marshallese Assembly of God, Rev. Roney Joel of the Hilo Marshallese Ministry, Rev. Glann Lokebol of the Marshallese Full Gospel Church, Mr. Ronald Fujiyoshi and Carmina Alik Hilo Marshallese Community President. Bring your friends with you to learn of the injustices of the past and why Marshallese are in Hawaii in growing numbers. An offering will be taken. Bring something to eat.